Popolazione dell l'impero Ottomano,1911 - republic-of-macedonias jimdo page! 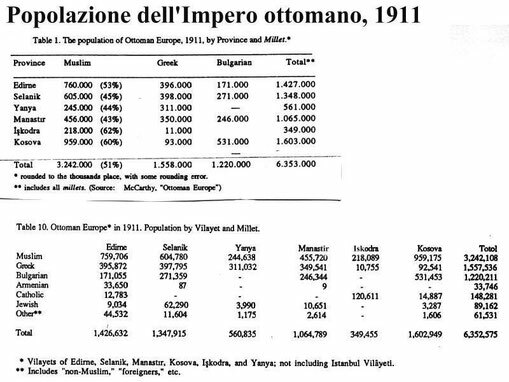 This is usual Ottoman Statistic that cruise the web, to prove that during the Ottoman time there were no Macedonians. It is usually kept in secret that the Ottomans were dividing the Population by their Religious affiliation, not Ethncity. So the Greeks are the Patriarchist affiliated Population, Bulgarians are the Exarchat affiliated Population, Jews are the Hebrew affiliated Population etc. Look at the Vilaet of Kosova, you will notice that the majority of the non Moslem Populaton are of Bulgarian affiliation. How ever we know that there are no Bulgarians in Kosovo, thus this Bulgarians in the Ottoman statistics are most likely the Serbs affiliated with the Exarchate, cause the Serb church had no access to Kosovo region till 1912. Another prove that this statistic are not Ethnic based is the fact that there are Moslem and Catolic affiliated Population. I would like someone to explain me what kind of Ethnic Groups are the Moslem or the Catolic one, if this has to be taken for Ethnic-Group statistic? Important Note: In the Kosovo Vilayet were included not only modern Kosvo, but Rashka, the old Serbia and Pech - the modern Sit of the Serb Church.